Ethan is a 6'0 260lbs (off-season), 31-year-old bodybuilder from York, Pennsylvania USA. Ethan has a great attitude and drive to succeed. He started lifting at about age 14 and played football and baseball in addition to throwing the shot put. Ethan's most recent contest was the 2013 NPC Jay Cutler Baltimore Classic on November 9, 2013. Ethan did well at that show and placed 6th. He also caught the eye of many people involved in the sport. Ethan has great potential to succeed in the sport of bodybuilding. 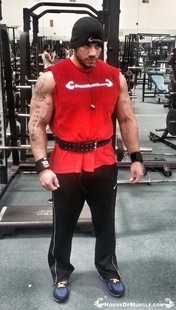 He currently runs a personal training business and has been a trainer for about 10 years. Ethan is very enthusiastic about succeeding in bodybuilding. He has a lot of knowledge about training and nutrition from his experience both as a competitive bodybuilder and as a personal trainer. Ethan is also a firm believer in working hard to achieve your goals. He understands that training, nutrition and supplementation are all cornerstones of success and feels "it comes from hard work, no matter what". Ethan was eager to pair up with House Of Muscle because of our no frills, straightforward approach. We both believe that hard training, clean eating, great supplementation and proper rest are the keys to building the lean, fit, strong and muscular body you desire.